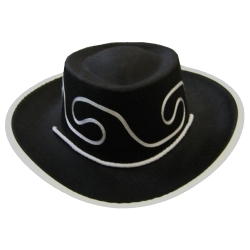 Black permafelt cowboy hat with braided chin strap, white embroidered design, and white trim on the brim of the hat. Hat has a 3” crown, a 2.5” brim, and will fit up to a 19” head measurement. This is the perfect hat for a child to dress as a cowboy for school, Halloween, or for play time as cowboys and Indians.